What happens when a “guaranteed sellout” doesn’t sell out? 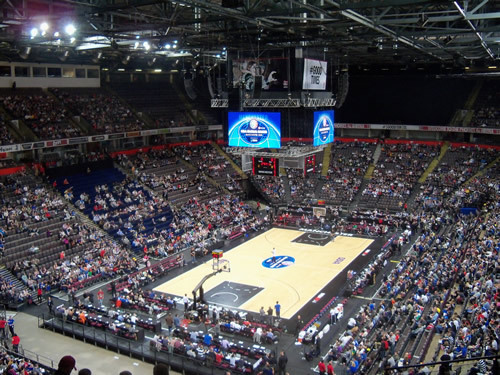 Around March & April there was much hype and excitement when Manchester announced that they were one of the places that are holding one of the rarest things – a NBA Global Game. 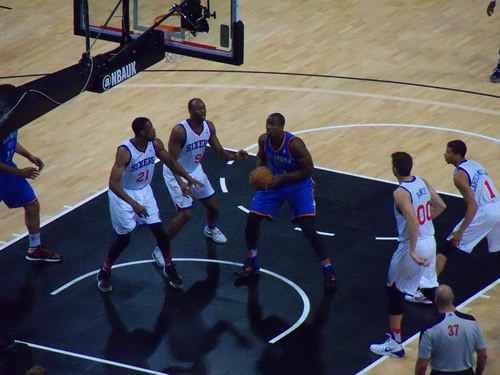 The games – held around the world – are preseason games, and this year Manchester held one: featuring the Oklahoma City Thunder playing the Philadelphia 76ers. This was announced with much fanfare, and when tickets went on sale I snapped one up. Unfortunately, from what I saw, not many other people did. You see, as the game approached, there was a bit of apathy. I’m not sure why – maybe that the tickets ranged from £50 (my seat) to a couple of hundred, or maybe Manchester just didn’t care. But anyway, as time went on, offers kept appearing on Facebook for this “guaranteed sellout” like for 15% off, 2-for-1 and the like. On the day of the game, there was even the worst one for me: spend £50 at the adidas store in town and you get a ticket for free. Gutting. But then I thought “maybe, you know, as an early adopter I’d get bumped up a tier or two?”, not so. Still in the nose bleeds, and there were a lot of empty seats below me. Ay well. One thing I did want to check out was the “Fan Zone”. American sports are brilliant at making you feel welcome with designated areas with things going on before the game. When I went to watch the Red Bulls vs Revolution in the MLS, outside was the fan zone, with free pool, free fusbal and (unforunately not free) beer. It was great and I was given a comemorative towel to for the game as well. Bonus! The NBA one was okay, taking over a section of The Printworks for basketball competitions and introductions. Which was quite good fun, but I was hungry and thirsty, so I dived into a Weatherspoons to take advantage of their steak night. Onto the game itself, and it did look a wee bit like a John Cena convention from the outside, as I joined the mahoosive queue to pick up tickets, onto a queue to get into the venue, followed by another queue to get merchandise. Merchandise that lacked badges, the only thing I was interested in (though I did take a good hard long look at the socks). In the end I grabbed a couple of beers and took my seat. All in all, the seats weren’t too bad, if a little bit high. Interestingly they did that countdown thingy where they count down to the start of the game which was pretty cool. We were also entertained by cheerleaders and stunt dunkers (is that the right word? ), as well as a parade of local projects made themselves known, before the teams arrived onto the court, and the game was underway. And really – to tell you about the game I can’t. There was one bit of excitement towards the end whereby Philadelphia pulled it back and needed 2 points to draw level, but OC Thunder did pull further ahead. I dunno if it was the alcohol (which wasn’t that much) or the apathy of the crowd rubbing off on me, but I couldn’t get into the game at all. I just couldn’t remember much. Still, there were a few celebrities there. Jack Rodwell was booed, Rio Ferdinand was booed more, Andrew Cole was quite warmly received and Fabrice Muamba got a chant. We also got introduced to John Amaechi, who was famous as being a Brit who played in the NBA. Also introduced was Dikembe Mutombo and Vlade Divac, two names I recognised from my years playing NBA Jam! Brilliant! 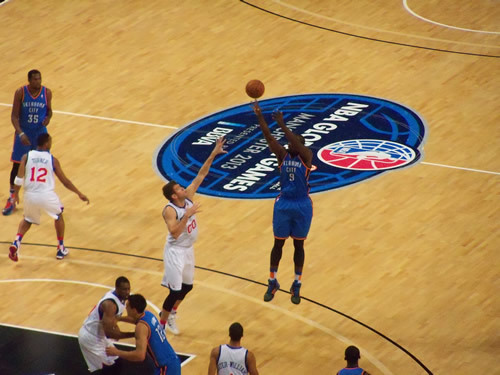 So all in all, Oklahoma City Thunder – as expected – won. We all went home. I’m not against basketball – when I was in the States I watched pretty much every game of the Miami Heat vs Dallas Mavericks finals when I was last over there and enjoyed it. I just think the apathy of Manchester didn’t make this game memorable for me. Shame, as it made history. And whilst it’s written by the winners – it is only read by those who care.